Take the appeal of tanzanite and mix it with the boldness of art deco and you'll find a truly stunning solitaire gemstone ring. This piece from Apples of Gold brings the beauty of tanzanite purple to the center of this ring with a 6mm gemstone. The tanzanite gem is round cut for just the right brilliant shine, and it is flanked on either side by two coils of gorgeous silver. The band gives art deco a display, too, with an excellent pattern of carved leaves that are polished to perfection. 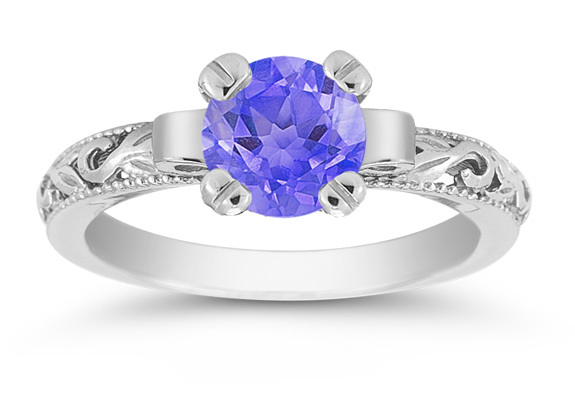 We guarantee our Tanzanite 1 Carat Art Deco Ring in Sterling Silver to be high quality, authentic jewelry, as described above.